Lovenoise, Stayonthego.com, Latham Entertainment, and 92Q present the homecoming event of the year. 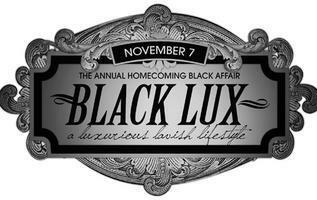 BLACK LUX – the ‘all black’ affair at the NEW Hutton Hotel on West End Ave. This event promises to be the best homecoming celbration of the 2009 season. We all know that Lovenoise delvers qulaity events for classy and upscale individuals. So ladies, this the time to step out in your all-black attire and represent yourself. Guys, you can do it too. Music for the night will be spun by Kenny Smoov and various DJ’s. It is recommended that you buy your tickets in advance. See you on Saturday @ the HUTTON HOTEL.